With the Tesla Roadster's tenure drawing to a close and a proper two-seat replacement seemingly just a twinkle in Peter Rawlinson's eye at this point, there's something of a coming void in the world of the electric supercar. Artega would love to fill that with the SE. It's an all-electric version of the company's GT supercar, and while the GT will not see a release on American shores, we got confirmation from Artega that the battery-powered SE will -- eventually. The 375 horsepower motor drives the car to 62MPH in 3.9 seconds and a top speed of 126.5. Maximum range is 172 miles, but drive the car "more enthusiastically" and you can expect a more realistic 124. The car was announced earlier this year at the Geneva Motor Show and here in Frankfurt we were able to spend a few minutes ogling its curves in a variety of interesting colors, including one model with a cut-away fender showing off the positioning of some of the 16 battery modules. 12 of those are scattered around the rear of the car, while four are up front, giving the car a rearward-biased 40:60 weight distribution. Cost is said to be 150,000 euro, or about $207,000. That's nearly twice the cost of a Roadster. Worth it? We'll see. 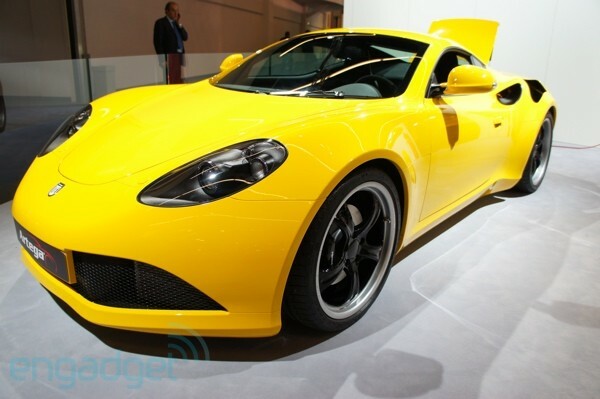 Artega SE electric supercar is coming to the US, we go eyes-on originally appeared on Engadget on Fri, 16 Sep 2011 16:43:00 EDT. Please see our terms for use of feeds.